Trying to update the flooring in your home can seem like a challenge when you own a pet, even a mild-mannered one. Thanks to our resilient flooring specialists, however, you’ll be able to quickly find the eye-catching easy-care flooring options you want. Our pet-friendly flooring not only looks great, but is designed to handle all of the scratches, stains, and side effects that come with owning a pet. You will find the stylish and durable flooring to install in your home with the help of our friendly and knowledgeable team. No longer does pet-friendly flooring have to be unappealing or have an industrial look. Thanks to advancements in the design and manufacturing of many resilient flooring types, you can find stunning flooring for your home that works is attractive and also manages to withstand any scratches or stains from your pets. Beautiful floors don’t have to be delicate anymore. Our team is ready to guide you toward easy-care flooring options that deliver the style you want while shrugging off many common cosmetic issues. 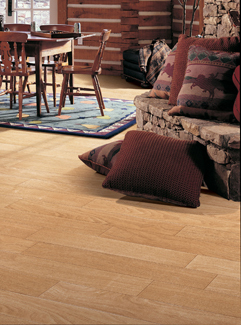 Installing a new floor into your home should be an investment you’ll enjoy and be pleased with for a very long time. So, don’t settle on an unattractive floor just because you want the added durability. Our flooring specialists are ready to show you a wide selection of easy-care flooring options, including sealed flooring, tile, and stain-resistant carpets, which are designed to give you both the durable performance you need as well as the gorgeous style you want. While there are a number of attractive flooring options that might catch your eye, you should always work with one of our flooring experts to make sure it is right for your home. One option to be weary of is unsealed hardwood flooring. While a very attractive selection, this delicate flooring can warp, stain, and scratch easily when installed in households with pets. Standard carpeting is another choice you might want to avoid if you own a pet, due to its penchant for capturing dander, dirt, and stains, which can lead to unwanted odors and discoloration. The look of these options, however, isn’t out of your grasp. Our team offers a variety of pet-friendly flooring options, including stain-resistant carpeting and sealed flooring, that deliver the look of the above delicate flooring options, while giving you the durability you need to cut down the appearance of wear and tear from your pets. Contact our helpful team of flooring specialists when you are looking for pet-friendly flooring options for your home or business. We are excited to work with customers living throughout the tri-county area, including those in Atwater and Turlock, California.